① Black painted profile for a common style of surface color. ② Only design for single side poster display. ③ The charging station can support for six people using at the same time, 3 pieces andriod charging wires and 3 pieces apple charging wire can meet different needs. ④ The charging wires can support 2.1Ah electric current for a long life time span. ⑤ Easy to move the display position can the power cord is long enough. ⑥ Customers can put the cellphones on the clear acrylic plate when they using the charging station, meanwhile they can have a better view of the graphics. And the charging station light box can be used flowing. ⑦ High quality material for a confirmed long using time. ⑧ All kinds of application available:fast-food restaurant,malls,chain-stores,banks,subway station,bus station,airport. Customized is available to fit to unique using circumstances and requirements ,we can change the design according to your needs to meet you requiry. If you have any ideas, please tell us. ① The Black Power Coated Single Side Poster Display Comercial Phone Charging Station can be packed with corrugated box or honeycomb box according to different shipping needs.If there is specific requiry about the packing such as wooden case,we also can design for the packing according to your requiry. Welcome your contact and look forward your inquiry. Customers' needs always come first. We pledge to provide you with professional service in designing and processing. 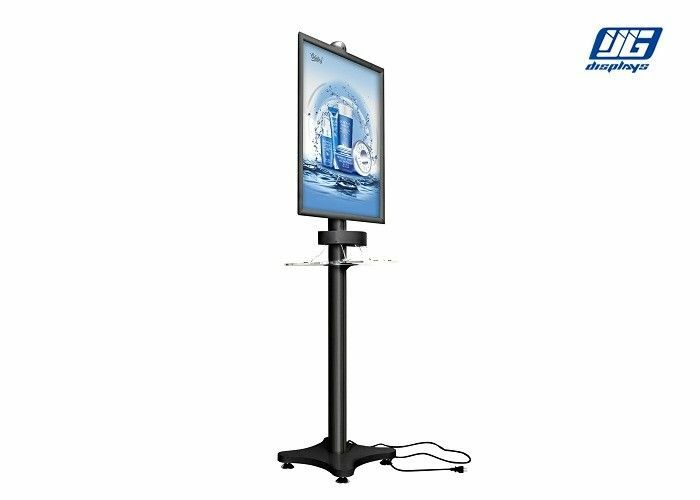 Over-10-year expericence are in accord with your assurance and recognition of our high quality Black Power Coated Single Side Poster Display Comercial Phone Charging Station.